Virginia, what a great place for a rendezvous. Every time we head to the Blue Ridge Mountains I feel as if I am home again. The beautiful Blue Ridge Mountains, along with good friends made the trip a special time. It is said that the joy is in the journey. Making all the plans. Getting everything ready. The sewing and practice. It all makes the Eastern a terrific vacation. If Virginia isn't pretty enough, going there in the fall of the year really adds to the beauty. 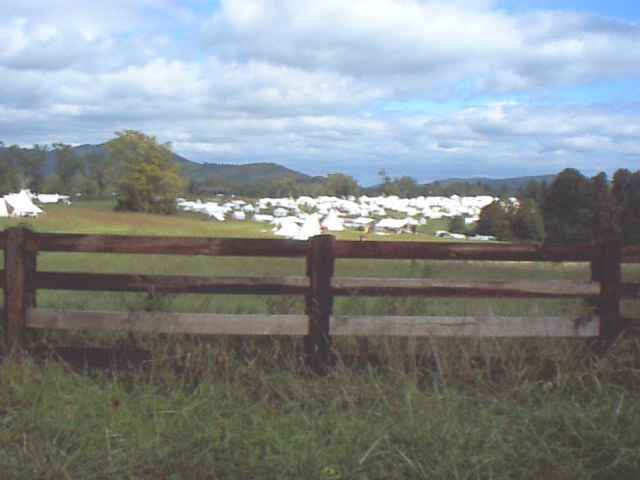 The 24th annual Eastern Primitive Rendezvous. We arrived there around noon on Saturday. Made good time even though Tom and Sherry's jeep over heated and blew a hose going up one of the mountains. I thought about napping on the way there but like a small child, I could not sleep for fear I might miss something. Now this years Eastern was all spread out. When I finally got my bearings on where everything was, they had left and weren't there anymore. Traders, traders, traders. It seemed they almost outnumbered the camps .IF you needed something and couldn't find it, you weren't looking very hard. The shooting program kept us busy. Rifle and, smooth bore. Congratulations to all the winners! A different tomahawk match daily. That was fun. And archery almost everyday. I really enjoyed that. The feast was successful. Really good meat this year. Thanks Tomahawks!!! Also lots of weddings taking place that week. Congratulations to the newly weds. We ate, drank and were merry and then it was time to leave. We really enjoyed the week and hated to come home. Now I get the fun of planning next years. Thanks to everyone who worked so hard putting on another fine Eastern.Ma and Guy and all the range officers.Salvo and Donna and Rick . Val and Tony and everyone else who lent a hand.